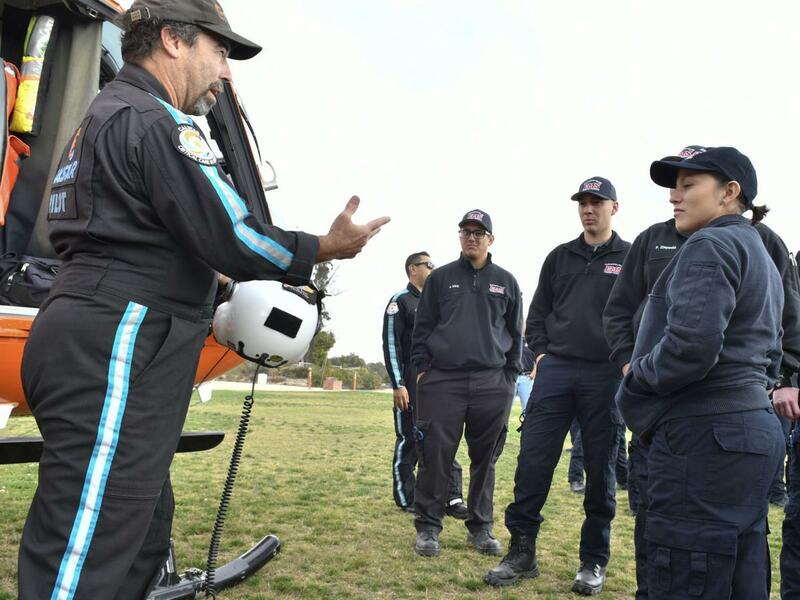 Cal Star helicopter pilot Mike Payne talks to students in Hancock College's EMS academy Wednesday at the Public Safety Training Complex in Lompoc. A 130-pound male lies on the ground, unresponsive, after a traffic collision. He's breathing on his own, but emergency medical technicians are concerned the victim may have suffered a neck or spinal cord injury. Within minutes of the call, a specially modified twin-engine helicopter lands not too far from the victim. Two flight nurses, one carrying a large backpack, disembark and run over to assess the patient. They recommend air transport, securing him to a backboard and loading him through the copter's rear doors. The victim, a student enrolled in Hancock College's emergency medical services (EMS) program, was never in any real danger. 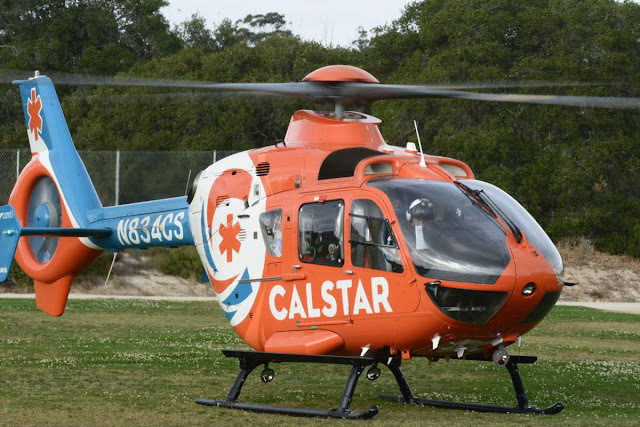 On Wednesday, the CALSTAR 7 (California Shock Trauma Air Rescue) flight crew landed at Hancock College's Public Safety Training Complex in Lompoc to simulate their response to a real-life medical emergency. From landing to takeoff and every step in between, the three-person flight crew — pilot Mike Payne, and flight nurses Raul Sandoval and Chris Aten — broke down their process and timeline for more than 30 aspiring emergency medical technicians. Their goal: to land and lift off in 10 minutes. "This [demonstration] covers operations for the ground and air units," explained EMS program coordinator Suz Roehl, who spent 15 years as a flight nurse with CALSTAR prior to joining Hancock. "We want them to come in because CALSTAR likes to train crew that are going to be around the aircraft." In addition to their flight crew, the EC135 helicopter CALSTAR operates can carry up to two patients from the scene of critical incidents -- car crashes, shootings or stabbings -- between two regional medical facilities. Based out of the Santa Maria airport, the chopper is capable of responding to most places on the Central Coast within 20 or 30 minutes. "You never know what you're going to get into," said Payne, a retired Navy helicopter pilot. "You've just got to be prepared for everything." His biggest piece of advice to aspiring pilots: speak up. "We're all a part of a crew," he said. "If they (the crew) doesn't like something I'm doing, they need to tell me to stop. If one person says they're not comfortable going [to an assignment,] we don't go." Sandoval, a registered nurse with 13 years of experience in the emergency room, recalled meeting CALSTAR's first flight nurse during a rotation at the Ventura County Medical Center. Describing the nurse as smart and accomplished, Sandoval said he dedicated time to improving his skills with the goal of joining a flight crew. "Being part of the flight crew is totally different than being a nurse," he said. "You have to communicate with other ground crews (fire, paramedics) and ensure that we're going to get to our destination safely." He called flight nurses the "Navy seals of nursing," and told hopeful flight nurses to brush up on their skills if they want to make the jump. "You need to better yourself in any way you can — mentally, physically or at your job," he said. "It's a hard job when you're on."